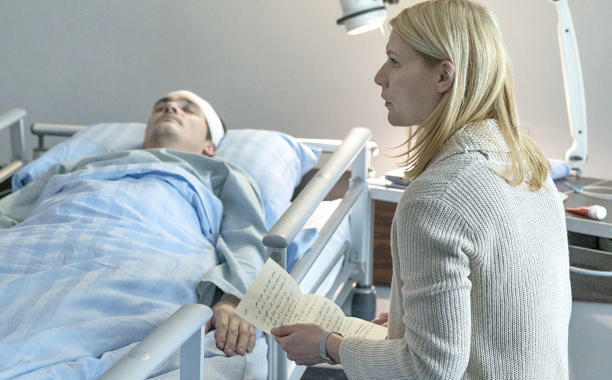 Homeland fans not content with last season’s white light cliffhanger – and desperate for more information immediately – should be happy with what showrunner Alex Gansa has to say about badass assassin Quinn, and his fate on the show. In a recent interview with EW, Gansa was asked about Rupert Friend (who plays Quinn) and whether or not the actor would return for the sixth season, given that season 5 ends with the character lying comatose in the hospital. To add to that, it’s suggested that lead Carrie (Claire Danes) was a few beats away from performing euthanasia on her old pal to let him go in peace. So there it is: Quinn is definitely back, but he probably will be bedridden for a portion of the season as he recovers from that sarin gas exposure last year. Otherwise, it’s already been reported that the new season will be set in NYC and – as topical as ever – take place during the tumultuous 72 day period between Election Day and the swearing in of the newest President.